Corn, with its natural sweetness, is one vegetable both kids and adults love. While frozen corn is processed quickly to preserve the sweet flavor, there's nothing quite like fresh corn from your garden or the farmer's market. Cut enough off the tip to create a flat top end. Place a small bowl, upside-down, in a larger bowl. This will give you better height for cutting and the kernels will fall into the bowl. Stand the cob on its flattened top on the small bowl. Holding the stem end of the cob, cut downwards through two or three rows of kernels with a sharp, sturdy knife or special corn cutting tool. Don't cut too close to the cob — cut about 3/4 of the way through the kernels. Another popular method uses a tube cake pan or Bundt pan. Stand the cob up on the center tube and cut the corn, letting the kernels fall into the cake pan. Continue until all rows of corn are cut from the cob. To get the milky juice and pulp left on the cob, scrape with the back of the knife blade. How to Cut Cream-Style Corn Use a grater to cut the corn from the cobs. 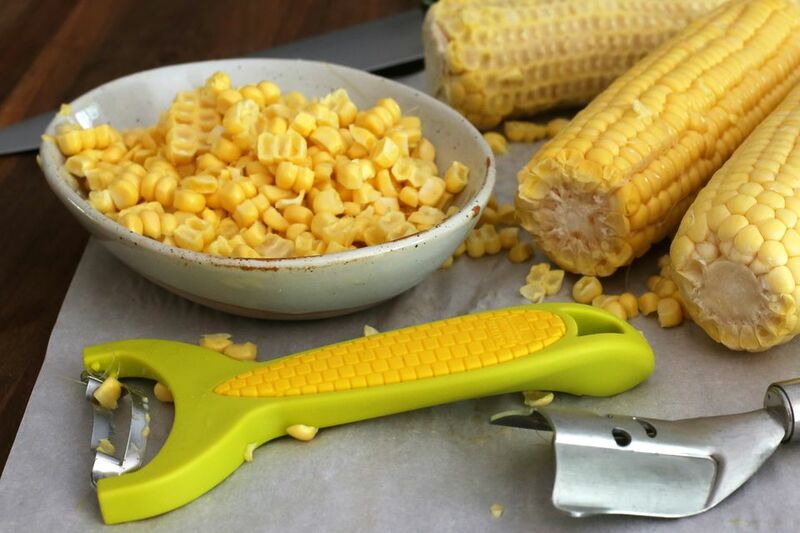 Alternatively, cut the corn with a knife or corn cutter, but cut at about one-third the depth of the kernels, then cut another one-third. Scrape the milky juices and remaining pulp on the cobs into a bowl. How to Freeze Corn on the Cob Blanch the husked and cleaned cobs in boiling water. Blanch small ears for 7 minutes, medium ears 9 minutes, and large ears 11 minutes. Cool in ice water and then drain thoroughly. Cut from the cobs as above, then pack the corn into zip-close freezer bags and expel as much of the air from the bags as possible. Label with the name and date and freeze. How to Cook Fresh Cut Corn Bring a saucepan with about an inch of water to a boil over medium heat. Add 2 cups of corn to the pan, cover, and cook for about 4 to 5 minutes. To microwave, put 2 cups of corn in a microwave safe baking dish or bowl with 2 to 3 tablespoons of water. Cover and microwave on 100% power for about 5 to 6 minutes. One medium ear of corn will yield approximately 1/2 cup of kernels. Four medium ears of corn will yield about 2 cups, the equivalent of a 10-ounce package of frozen corn. When choosing corn, look for husks that are tightly closed. The stem should be green and not woody. The corn cobs should feel plump with corn and have plenty of golden silk coming from their tops.